Here are some fruit smoothie recipes that are a hit for kids and adults. 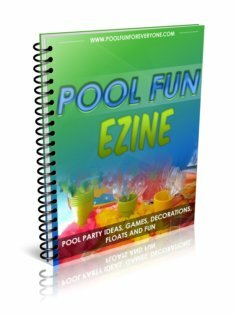 You can serve them as an appetizer, a dessert, or just by themselves for a last minute evening by the pool. Not only are these smoothies cool and refreshing, I always have smoothie ingredients on hand since I love to use frozen (preferably organic) rather than fresh fruit. The variety and possibilities are endless. My granddaughters love making them with me. 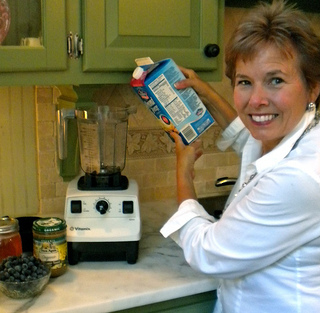 Maybe you've never served smoothies before and are wondering how to make smoothies? It does the best job of mixing up fruit, and I hope to never have to buy a blender again. Really, any blender will do. Don't stress over which one to buy. 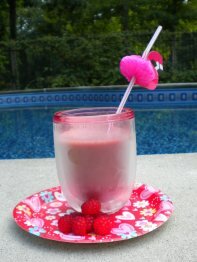 But if you want to make your smoothies out by the pool with your guests use a cordless, rechargeable blender. My neighbor came over and we used her cordless Breville hand blender to make our smoothies. Everyone helped to make their own and great fun was had not only in drinking them, but making them as well. My fruit, even bananas, are always frozen, so the smoothie is really good and cold. After the bananas turn ripe, I slice them up and put them in a freezer bag for later use. Many people use ice in their homemade fruit smoothie - instead I use frozen fruit. The fruit makes a nice thick smoothie with lots of good for you ingredients. I buy most of my fruit for smoothies in frozen bags - like frozen mangos, pineapple, strawberries, and blueberries. Or when organic strawberries are on sale I buy a bunch then wash and freeze them. Add your milk, almond milk, soy milk first and then your fruit. We don't use fruit juices as they are full of sugar with very little nutritional content. Don't overfill it or fill it up to the top. Give your blender plenty of space to blend. Make two batches if you need to. I like my fruit smoothie really smooth - that's why it's called a smoothie, right? If it's too chunky just turn the blender on again. If it is too thick for you, add some more liquid. It's hard to pick a favorite of all our fruit smoothie recipes, but if we were to pick only one it would be our easy strawberry smoothie recipe. Do you go pick your own strawberries in early summer? Freeze a bunch of them so you can make fruit smoothies year round. This homemade fruit smoothie recipe is a big hit for kids and adults. While the adults had a celebration drink, the kids had their own version of a sparkling strawberry beverage. Mix in a blender and fill each glass with 1/2 of strawberry puree and 1/2 sparkling apple juice. Our grandkids loved it! 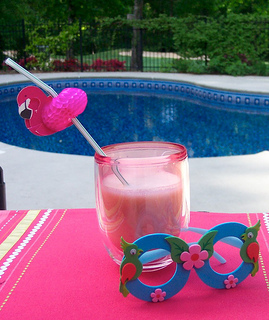 Serve in a plastic glass with a fun straw. A blueberry smoothie recipe makes a great tasting and healthy homemade fruit smoothie, rich in antioxidants. Mine are truly "homemade" starting with blueberries picked right from our back yard. Instead of providing an appetizer, I often serve a refreshing, cold fruit smoothie to our guests and they love them. My little granddaughter's love raspberry smoothie recipes because they are pink - I like them because they taste great, are low in the glycemic index and are full of antioxidants. Three years ago I planted two raspberry bushes along the pool fence, expecting them to probably die. Well, this year they are covering the fence and going crazy with tons of blossoms. I'm not sure I'd recommend raspberry bushes for your pool landscaping as they are rather prickly, but I'm going to enjoy those raspberries. The key to simplicity for this home made fruit smoothie is to buy frozen, already pealed mango slices. We love this fruit smoothie combined with some other tropical ingredients. 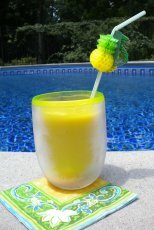 Mango smoothie recipes can be used as an easy breakfast on the go or served as a refreshing "cold appetizer" for your pool guests. I keep it simple, by having bags of frozen cut up mangoes in my freezer, along with some frozen bananas. Here is a great tropical smoothie recipe using mangoes. As always, you can adjust the recipe by adding or eliminating other ingredients. Blend to the consistency that you like, adding more or less liquid. You can turn any fruit smoothie recipe into a healthy fruit smoothie recipe by altering the ingredients and by "hiding" some good-for-you but not great tasting stuff. I am also a registered nurse with a strong bent on wellness and disease prevention. Diet and nutrition play a vital role in our health - that's why we grow our own blueberries and raspberries. Here are some healthy substitutes or healthy ingredients you can add to your smoothie. 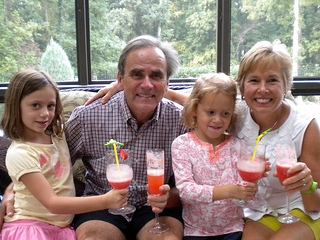 I make my healthy smoothies for my granddaughters whenever they come over - they love them. 1. Use Unsweetened Almond Milk ( I use Almond Breeze) instead of milk; if using milk buy organic milk. 6. Organic Goji Berries These berries are rich in many different vitamins, minerals and protein. 7. Use Organic Yogurt - Do not use artificially sweetened yogurt. There is a lot of natural sugar even plain yogurt, and even more so in fruit yogurts. If you are looking for healthy fruit smoothies, use plain, organic yogurt (look for containers that say "Live and Active Cultures") and do not use artificially sweetened ones.